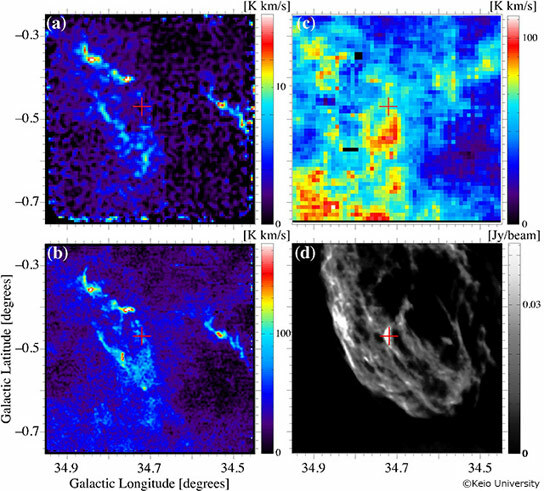 Image illustration of propagation W44 shockwaves in the molecular cloud. Using the 45m Telescope at Nobeyama Radio Observatory and the 10m ASTE telescope, scientists were able to make high-sensitivity video imaging observations of the full area of W44 and precisely measure the expansion velocity of the W44 shockwave. 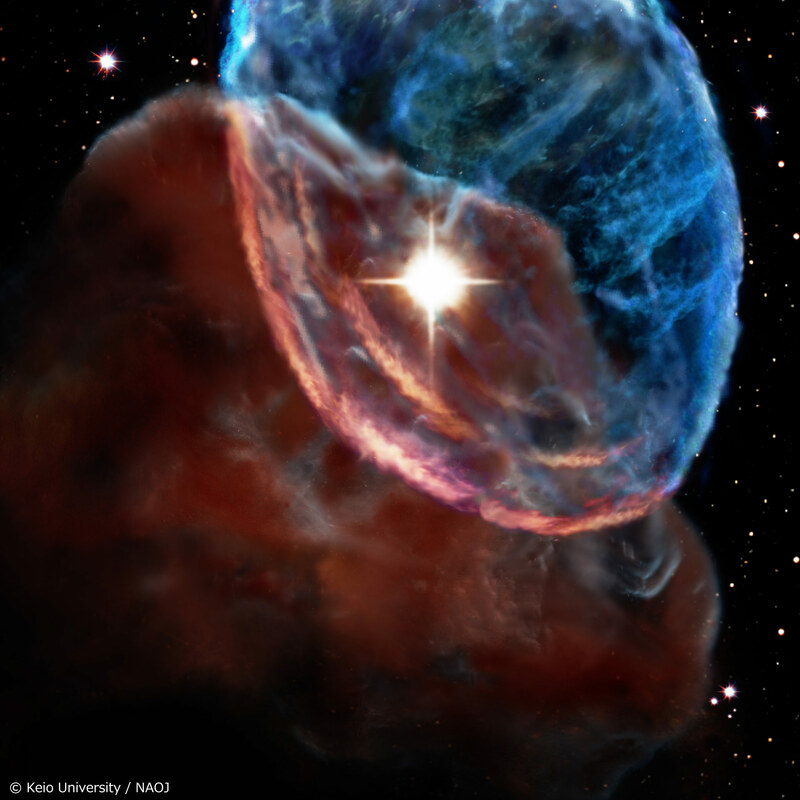 A research team led by Tomoro Sashida and Tomoharu Oka (Keio University) has succeeded in precisely measuring the expansion velocity of a shockwave of the supernova remnant W44. The remnant is located in the constellation of Aquila, approximately 10,000 light-years away from our solar system. The team observed the high-temperature and high-density molecular gas in the millimeter/submillimeter wave ranges. The analysis shows that the expansion velocity of the W44 shockwave is 12.9±0.2 km/sec. In addition, it became clear that the supernova explosion released kinetic energy of (1-3)×1050 erg into the interstellar medium. The energy emitted from the Sun is approximately 3.6 × 1033 ergs/sec. Can you image how enormous amount of energy is released from the supernova explosion? Furthermore, other molecular gas with an extremely high velocity of higher than 100 km/sec was also detected. The origin of this super-high-velocity molecular gas remains unclear at the present time. A star with a mass of more than eight times of the Sun releases tremendous energy when it is dying and undergoes a supernova explosion. The shockwave caused by the supernova explosion expands, having a strong impact on the composition and physical state of surrounding interstellar materials. It also emits kinetic energy into interstellar space. “Galactic winds” blasting out a large amount of gas are often observed in galaxies where explosively active star formations take place. The energy source of such galactic wind is also thought to be many supernova explosions. Thus, supernova explosions have an immense influence on interstellar space. Nevertheless, there has been no quantitative research on the expansion velocity and kinetic energy of a supernova shockwave. This is because wide area must be observed in order to study the expansion velocity and kinetic energy of a supernova shockwave. Wide area observations with the existing equipment require quite long observation times. Therefore, observations of interstellar gas influenced by a supernova shockwave have been limited to a narrow area. Radio wave image of the direction to the supernova remnant W44. (a) Line intensity map of HCO+ J=1-0 rotational transition, (b) Line intensity map of CO J=3-2 rotational transition, (c) Line intensity map of CO J=1-0 rotational transition, (d) Intensity map of 1.4 GHz radio continuum radiation. The red cross shows the position that the “super-high-velocity component” is detected. The research team started its observations mainly with radio telescopes in late 1990s. The purpose is to study interaction of the supernova remnant W44 and the adjacent giant molecular cloud (GMC). W44 is a roughly 6,500~25,000-year-old supernova remnant located approximately 10,000 light-years away from the solar system. Attached to the remnant is a GMC with a mass of approximately 300,000 times the mass of the Sun. Since observation began, molecular spectrum lines with a wide velocity width have been detected in the W44 molecular cloud in various places. They have been interpreted to be gas that has been accelerated by the passage of the supernova shockwave. The research team used the 45m Telescope at Nobeyama Radio Observatory (NRO), National Astronomical Observatory of Japan (NAOJ), and the 10m ASTE (Atacama Submillimeter Telescope Experiment) telescope to make high-sensitivity video imaging observations of the full area of W44. The relations between the distance from the center of supernova remnant and the radial velocity calculated from Doppler shift of spectrum line. (a) is the HCO+ J=1-0 spectrum line, (b) is the CO J=3-2 spectrum line, the red line represents the result of model fit. The observations revealed that spectrum lines with a wide velocity width were detected throughout the whole area where W44 overlapped the GMC. The research team calculated velocity centroids from these spectrum lines and examined their spatial distribution. From the distribution, a clear velocity gradient was found throughout from the center to the edge of W44. This can be thought as the expansion activity of shocked gas, or molecular gas affected by a shockwave. Based upon the uniform expansion model of the rotating spheroid, expansion velocity of 12.9±0.2 km/sec was estimated. The mass of shocked gas was evaluated as 1.2±0.6 times the mass of the Sun based on the spectral intensity. From these values, we were able to estimate the whole kinetic energy transmitted from the supernova remnant to interstellar materials as (1-3)×1050 erg. This value is equal to 10~30% of the total energy of the supernova explosion (~1051 erg), and roughly consistent with previous theoretical predictions (about 10%). 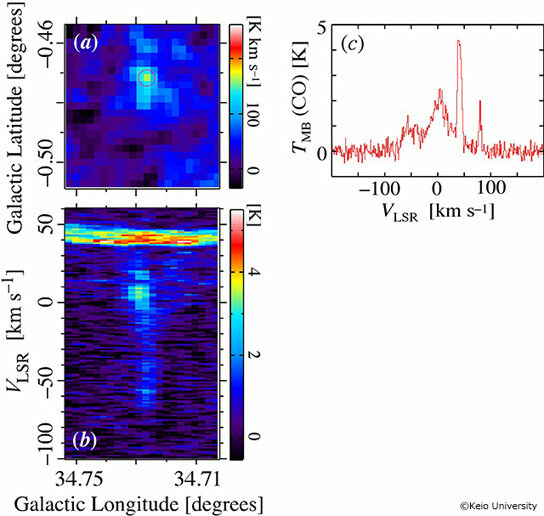 In addition, the observations detected a molecular gas component with an extremely high velocity (>100 km/sec). These positions of super-high-velocity molecular gas are the exact locations where the sources of continuum radiation and a molecular hydrogen oscillation emission line are also detected. This indicates that very strong shockwaves existed locally. The origin of the super-high-velocity component remains a mystery at the present time. The research team plans to plow ahead this research to uncover the nature of the mysterious component. 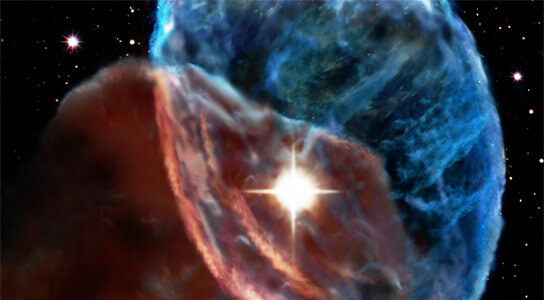 Furthermore, the team will observe a larger number of shocked gases surrounding the supernovae to confront these observational results with theoretical models of a supernova shockwave. Be the first to comment on "Scientists Measure the Expansion Velocity of Supernova Remnant W44 Shockwave"